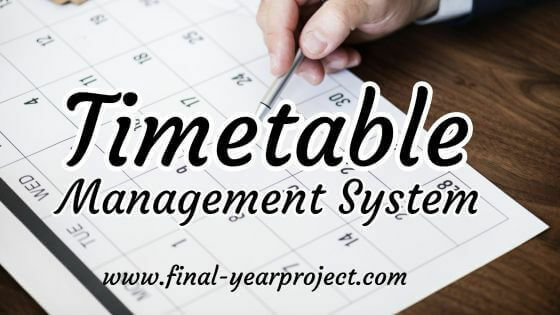 "Timetable Management system" is an automated system which generates timetable according to the data given by the user. The main requirement of the application is to provide the details about the branch, subjects, number of labs, total no. of period and details about the lab assistant. Then the application generates the timetable according to your requirements. It will help in automating the tedious job of making the timetable manually. You can also subscribe to FINAL YEAR PROJECT'S by Email for more such projects and seminar. The proposed system is completely computer-based application. In the proposed system administrator should not worry about their late and improper management of sales details. All the information will be available by just clicking on a single button. Thousands of records can be searched and displayed without taking any significant time. 1. Create a Time Table Management System to be used by any College. 2. To perform the basic requirements of the firm. 3. Maintaining databases of the subject, Class, semester’s details. As it is a computer-based project, so maintenance and working are somewhat difficult from the manual mode of approach. It is not possible to associate each and every requirement of the system so in some way or other it will going to create a problem at some stage of execution (like report generation). As a computer-based System, it is easier to fetch data from the database for unsocial activities. Also easier to destroy the existing ones. 1. On implementing this package the organization will get error-free data to analyze. 2. The administrator will track the information of customers and items easily. 3. Daily sales report can be easily maintained and generated. 4. It will give better planning process. 5. This package would limit the time and money factor involve in “Time Table Management Process”. 6. Maintenance is much easier and accurate than the existing manual system. 7. Security features are somewhat higher than that of a manual approach. The implementation view of software requirements presents the real worlds manifestation of processing functions and information structures. In some cases, a physical representation is developed as the first step in software design. However, most computer-based systems are specified in a manner that dictates accommodation of certain implementation details. In this project, JAVA (J2SE/J2EE), Swing, JDBC programming are used under Eclipse environment. This project report contains data flow diagram, feasibility study, E-R diagram, screen layouts, etc. Please use this report for your reference and study purpose only. This is only project report and does not contain programming or source code of the project.